Located in Saint Paul, Minnesota, Carmen Simonet Design LLC is the studio of Carmen Simonet, a landscape architect and graphic communications specialist. Carmen provides landscape master planning, site design, sustainable landscape design, web and graphic communications services. Carmen has over twenty years of professional experience from community-based planning projects, to streetscapes, parks and private gardens. Her roots as a gardener, environmentalist and artist, reach back even farther. In her own garden she experiments with regenerative design strategies, edible landscaping and native plants. 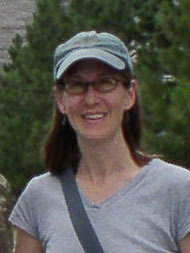 Clients value Carmen's sustainable landscape expertise and native plant knowledge. They also appreciate her aesthetic sense and ability to visualize and communicate ideas, to collaborate and to manage projects in a timely manner. Since establishing Carmen Simonet Design LLC in 2003, Carmen's projects have included residential garden designs, planting plans for businesses, developing a park overlooking Saint Anthony Falls, graphic design for an engaging series of interpretive signs and a sustainable landscape plan to "green" the Midtown Greenway from Hiawatha Avenue to the Mississippi River.